On January 25th 2014 the Mars Exploration Rover “Opportunity” celebrates ten years operations on the surface of Mars. This blog provides a little insight into that remarkable ten year (and continuing) mission. If you click on the Documents section you can find a PDF document I’ve put together for download providing an overview of Mars Exploration and the Opportunity mission. In future blogs I’ll provide some insight into the reasoning for Mars exploration and the current program for Mars exploration being pursued by NASA and ESA in particular. For now, it is surely appropriate to reflect on the remarkable MER Opportunity rover. 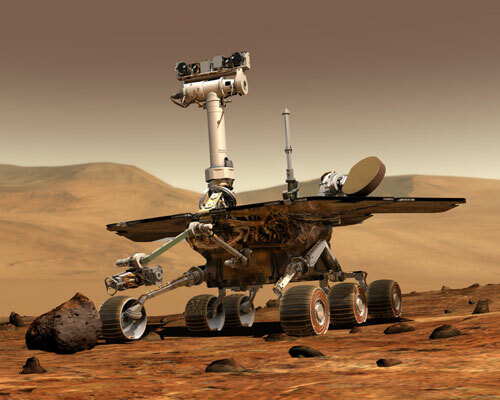 The Mars Exploration Rovers (MER) Spirit and Opportunity both landed on Mars in January 2004. Their mission was straight forward – to investigate whether their respective landing locations once retained large bodies of standing water on Mars billions of years ago. Verification of past surface water would strengthen the case for Mar being similar to Earth in its early history, and perhaps of life-related activity occurring on the planet. Since Mars still retains a planet-wide record of its early planetary activity, any such discovery would present an unprecedented opportunity for humanity to further explore and examine conditions similar to those that gave rise to life on Earth (conditions long since gone from our world). While within just months of landing on the surface Spirit had verified that the 100km wide crater it landed in was indeed a vast lake in its early history, Opportunity’s landing was nothing short of remarkable. It scored a ‘cosmic hole in one’ by inadvertently landing within a tiny 22m wide crater upon a vast flat plain called Meridiani Planum, suspected to have been a sea on Mars billions of years ago. Nothing could have prepared scientists for what they were about to witness, starting from the first images sent back to Earth by Opportunity: images of the exposed walls of the tiny shallow crater revealing water-based sedimentary layered structure and even salt deposits on the surface of the crater; immediately and unequivocally verifying that Meridiani Planum had indeed been a sea on Mars billions of years ago. Although MER Spirit and Opportunity were chartered to carry out a 90-day primary mission (with extensions expected), nobody had expected that, 10 year later and 40 kilometres down range, MER Opportunity would still be operational. Not only has Opportunity survived four sub -100oC Martian winters, but it also managed to survive a 3-year, 20-km trek across the vast sandy plains of Mars to reach a huge 22km-wide crater called Endeavour, which it arrived at in September 2011. To add poignancy to Opportunity’s mission, NASA revealed to the World in September 2011 (in honour of the tenth anniversary of the 9-11 Twin Towers attacks) that a small piece of aluminium making up the robotic arm of Opportunity originated from the shattered aluminium body of one of the World Trade Centre Twin Towers. Today, Opportunity is still going strong. It has been reprogrammed from Earth to be an autonomous artificial–intelligent “thinking machine” capable of planning excursion and scientific investigations on its own and without instruction from Earth. Although showing signs of wear and tear, it celebrates 10 years of roving across the surface of Mars on January 25th 2014, after which it will embark on among its most important scientific investigation – a several kilometre excursion south along the rim of Endeavour crater to a site found from orbit to retain clay materials – materials that formed billions of years ago in a non-acidic water environment, and materials which on Earth are seen as potentially important to the origin of life here. The years ahead for Opportunity may turn out to be its most productive of all; contributing to one of the most extraordinary feats of exploration every undertaken by humanity. o	Since Mars retains a planet wide record of that early activity similar to Earth, it offers a significant opportunity to explore the origin of life itself, and to determine if life arose there. •	January 25th 2004: Eagle Crater: Opportunity arrived on Mars on Meridiani Planum – a dried ancient sea bed near Mars’ equator. It landed in a small crater called Eagle Crater, approximately 22m across and showing both water-based sedimentary layering and precipitated sea salt on the surface all around the rover. An extraordinary happenstance. •	April 20th 2004: Endurance Crater: After about 80 days, on April 20th 2004, Opportunity arrived at a football-stadium sized crater called Endurance Crater, at about 800m distance from its landing site. There, it discovered sedimentary rocks created by water deposition, and verified that the region had been inundated by water from two different seas at two different eras in Mars’ ancient past. •	January 2005 – September 2006: Opportunity travels over 7km to a 700m wide crater called Victoria Crater. On route it becomes lodged in a tiny sand-dune (subsequently called “Purgatory Dune” and requiring NASA to spend 6 weeks to dislodge the rover). 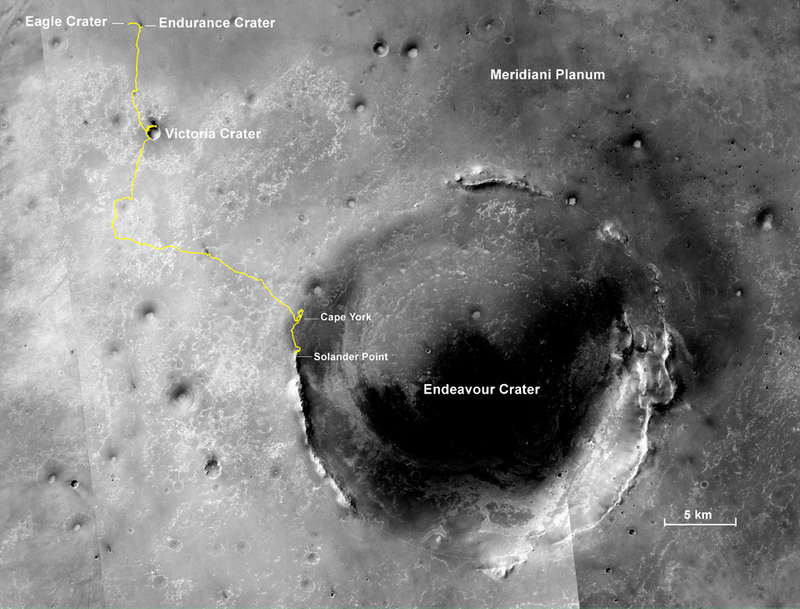 On route to Victoria crater Opportunity finds further extensive evidence that entire regions was once a sea. As the rover arrived at Victoria crater it was photographed from Mars orbit by the newly arrived Mars Reconnaissance Orbiter which can image objects from orbit as small as 30cm on the surface. 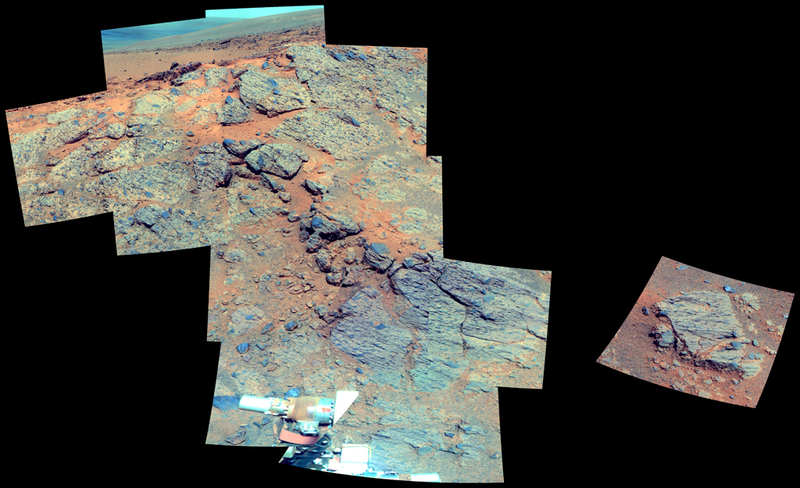 •	August 2008 – September 2011: Journey to Endeavour Crater. The decision was taken in August 2008 to send Opportunity on an epic 20km trek to a 22km wide crater called Endeavour Crater. For 3 years the rover drove relentlessly across the Martian landscape and arrived at Endeavour Crater in August 2011. This is now regarded as among the most epic voyages of exploration every engaged by humanity. On route the rover photographed a meteorite that was then given the name “Oileán Ruaidh” – named after the island off the coast of Donegal of that name and bearing a very similar shape! •	September 2011 – Present Day. Since late 2011, Opportunity has been exploring the rim of Endeavour Crater because the rim material is composed of materials from Mars’ earliest history over 4 billion years ago. It may yet make some of its most important discoveries at this location, including the examination of clay materials that only arise as a result of water that is neither acidic nor alkaline but instead is of neutral pH. Clay materials are seen as important to natural processes potentially leading to the origin of life. •	Present-day – the future: Opportunity has traveled over 40 km across the Martian surface and will continue its voyage of discovery for the foreseeable future. •	Mission Duration: Still roving! •	Verified that Meridiani Planum was an ancient sea. Verified that at two different times in Mars’ past a sea resided there; for a minimum of several hundred thousand years (and likely millions of years) in each era. •	Unequivocal evidence (for the first time) of surface water on another world. This also suggested that Mars possessed a dense atmosphere about as dense as Earth’s atmosphere today. Although the water activity at that location was probably not conducive to life as we know it, water is seen as a crucial ingredient to the origin, inner-workings and development of life as we know it. •	Opportunity will shortly analyse surface clay materials – suggesting water from yet another era and this time much more conducive to life as we know it. Clay materials are seen as important in aiding the polymerization of organic and genetic materials. Caption: Artist Impression of MER Opportunity on Mars. The Mast Stereo Camera and Robotic Arm are seen clearly. 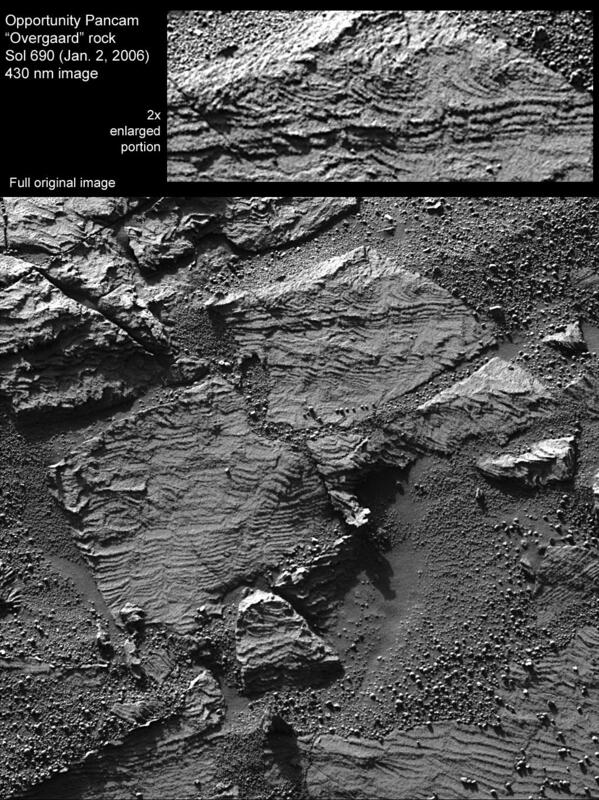 Caption: This image shows distinctive centimetre-sized “festoons.” They imply the presence of small, sinuous sand ripples that form in water, and are the preserved remnants of tiny underwater sand dunes formed long ago by waves in shallow water on the surface of Mars. Image showing MER Opportunity’s epic journey across the Martian surface. Opportunity was not designed to travel such vast distances, but so well built is the rover that to date it has traveled almost 40km – the furthest any machine has traversed any world beyond Earth. Opportunity shows no signs of stopping, and may have several more years of operational life left. Opportunity’s location in January 2014: Murray Ridge is on a part of the rim of Endeavour Crater called Solander Point. Murray Ridge is named in honour of Bruce Murray, former head of the Mars Viking Mission, Director of JPL and co-founder of The Planetary Society, who passed away on August 29th 2013. This image was taken on the 3,496th Martian day (Sol) with Opportunity’s near-infra red camera. Each colour represents a different mineral; enabling scientists to decipher Mars’ ancient surface activity because different minerals form under different temperatures, pressure and humidity. Despite the remarkable statistics regarding Opportunity’s journey, it is the scientific data that Opportunity returns to Earth relentlessly that is most valuable of all, allowing us to understand Mars’ early history and favourability for life-origins related processes; a challenge still in its infancy.